Third Squad detectives are investigating a Robbery that occurred on Saturday, December 12, 2015 at 5:32 pm in East Hills. Police have arrested (left) Robert Gunsberg, 55, or Long Beach, and (right) Patricia Bertone, 52, of West Hempstead, in connection to the robbery and assault case of a 52-year-old woman in East Hill on December 12, 2015. 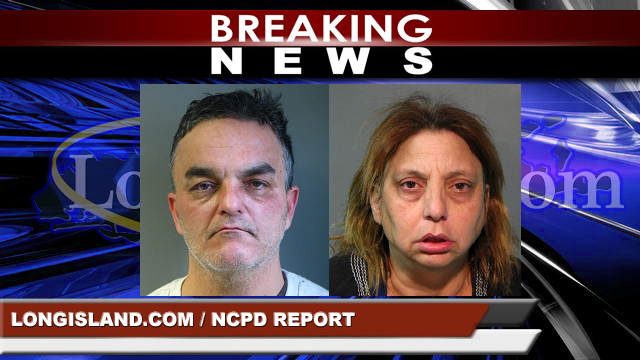 Update - January 16, 2016 - The Third Squad reports the arrests of Patricia Bertone, 52, of West Hempstead and Robert Gunsberg, 55 of Long Beach for the below crime. Bertone is being charged with Robbery 1st degree, Assault 2nd degree and Hindering Prosecution 2nd degree. She was arraigned on Friday, January 15, 2016 at First District Court in Hempstead. Gunsberg is being charged with Robbery 1st degree, Assault 2nd degree and Obstruction of Breathing. He will be arraigned on Saturday, January 16, 2016 at First District Court in Hempstead. East Hills, NY - December 12, 2015 - Third Squad detectives are investigating a Robbery that occurred on Saturday, December 12, 2015 at 5:32 pm in East Hills. According to detectives, after returning home to her Peacock Drive residence from shopping, pulling into the driveway and unloading her packages, the 52 year old victim was approached by a male subject who grabbed her and demanded the jewelry she was wearing. After a continued struggle, the subject began punching her in the face at which time the victim gave the subject her rings. He then grabbed her pocketbook and fled the scene. The victim followed the subject and was observed entering a dark colored auto that left southbound on Peacock Drive. During the altercation the victim sustained contusions and abrasions to her head and was transported to an area hospital for treatment. She further described the subject as being 5’8”-5’11” tall and wearing a dark colored hoodie. Subject: LongIsland.com - Your Name sent you Article details of "Man & Woman Arrested for Robbery and Assault of a 52-Year-Old Woman Unpacking Her Car from Shopping"